Today, I had the pleasure of facilitating four small group sessions at the Enterprise 2.0 Executive Forum 2009. The topic was virtual worlds and enterprise, and thanks to the participants in the groups, it turned into a very interesting exchange of ideas. The agenda of the overall forum was much wider: the use of Web 2.0 technologies in business. What’s impressive about this forum is the breadth of roles amongst participants – CEOs, CIOs, learning and development professionals, marketing professionals and general operational staff were in attendance. As I’ve found before at these events, there are a growing number of people in business who see the potential of virtual worlds, but they struggle to get the same recognition throughout the business. That said, Australian business continues to lead the way in the area and it was great to see the level of passion for the opportunities virtual worlds provide. 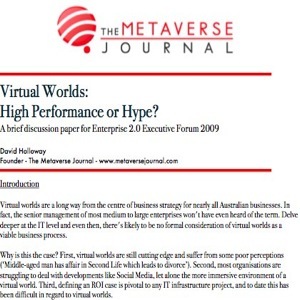 As part of my involvement I produced a four-page discussion paper: Virtual Worlds in the Enterprise – hype or high-performance?. It’s a bare-bones overview of the opportunities virtual worlds provide for business and a brief summary of five virtual worlds to watch (Second Life, VastPark, OpenSim grids, OLIVE and Metaplace) – there are obviously many more but as an overview they provide a good snapshot. Anyone regularly exposed to virtual worlds won’t get a lot out of the document, but if you’re one of our readers who’s just dipping their toe in the water, it provides a basic launch pad for a wider exploration. You can download Virtual Worlds in the Enterprise – hype or high-performance? for free by going to this page. You only need to provide your name and email address to be able to download a PDF of the paper.